Two simultaneous broadcasts at this weekend’s DreamHack Stockholm made for odd juxtaposition. The 16 pros in the European Hearthstone Qualifiers sat inches apart in silence, while 50,000 viewers at home screeched and wailed along with every great play. Just metres away, by contrast, it was the professionals in the European WoW Arena Tournament who screeched and wailed – while punters walked on past in quiet bemusement. So what does Hearthstone have that WoW PvP doesn’t? Well: for starters, Hearthstone has access to the eSports apparatus Blizzard have set up over the last decade for StarCraft. “World of Warcraft was obviously created well before eSports blew up to the way it is now,” pointed out Phan. “We knew there was a competitive element to World of Warcraft, and then it just kind of blew up from there. This is no natural spectator sport. WoW’s complexity and third-person perspective can make Arena matches impossible to parse even for 10-year veterans of the game. And there are “little things” going into new expansion Warlords of Draenor designed to help with that, like a spectator mode. 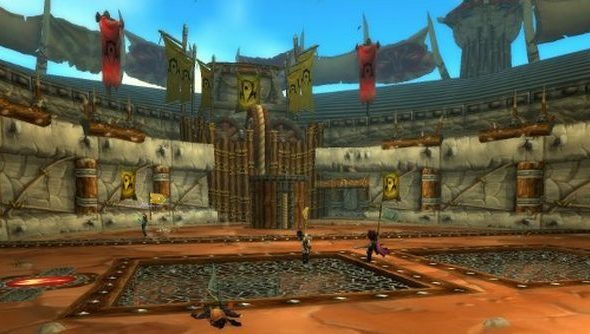 But even now, Blizzard don’t pretend that Arena play is the perfect medium for competitive WoW – and are open to new alternatives. “There’s a lot of different components to World of Warcraft, and eSports are really all about how you choose to spectate the game,” said Phan. “PvP is just one way. That’s just the one that was adopted first. Where do you think the competitive heart of WoW lies, if indeed it has one? In PvP or in raids?